Playing Ugly Dolls - Super Inky! I love Ugly Dolls. I first got mine back in 2005 and they are my favorite toys ever. Violet and I like to play with them when we're together. Luckily, here in New York City, my friend Lia is also obsessed with Ugly Dolls. When I got Secret Mission Ice Bat (he's black) for my birthday, Lia came over so we could play with our Ugly Dolls together. Lia always plays with Poe, who is a green dragon. Ice Bat is definitely my favorite. I can't believe I have two Ice Bats now! I think it would be fun to have an Ice Bat battle. He's totally the best character, but Poe is cool too. 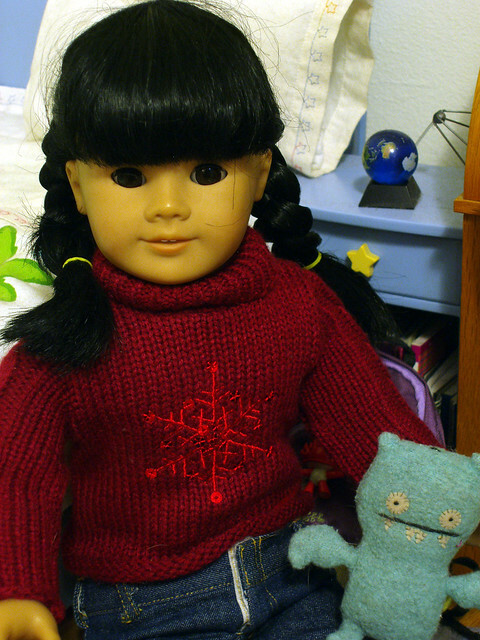 I'm thinking it would be really fun to have an Ugly Doll birthday party next year. What do you think? Well, I'm off to go play. Happy Winter! I agree-Ice bat is the best! I don't have either yet but hopefully I'll get one at least, hehe. Marina, Kirsten and Heather all have one. If you had an Uglydoll birthday party...can I come? You totally helped get us into them, hehe. That's great that you have a friend other than Violet, that loves Ugly Dolls. Lia sounds like such fun! Ugly Dolls are so cute, and we think Poe is adorable.